Who needs to be on-board? Which Company WILL BE the EMVO On-Boarding Partner? A corporation/group of companies has to decide which legal entity will act as their On-boarding Partner (OBP). All relevant data of the Marketing Authorisation Holders (MAH) of the corporation/group of companies will be transferred via the OBP to the EMVO (EU Hub). A Marketing Authorisation Holder is the organisation which owns the serialisation data and which is accountable for uploading the data to the EU Hub (e.a. XYZ Sales Company in EU member country). Possibly an affiliate of the OBP; for smaller companies the MAH and OBP could be the same. An OBP is a legal entity that is part of a Corporation or a Group and will send data to the EU Hub on behalf of Marketing Autorisation Holders that are also part of that corporation. The group of MAHs represented by the OBP either consists of Original Pack Manufacturers (MAH without Parallel Distribution Activities) or Parallel Distributors (MAH with Parallel Distribution Activities). The OBP is the contracting party of EMVO and concludes the Participation Agreement. The OBP is legally authorised to sign on behalf of a MAH/a group of MAHs. The OBP has to be affiliated to a MAH/a group of MAHs. Who is affected by the Falsified Medicines Directive? in relation to a party, any other entity Controlling, Controlled or under common Control with the party. either the holding, directly or indirectly, of 50 % or more than 50% ownership interest or the statutory or de facto authority to exercise a decisive influence on the appointment of the majority of directors or managers or the orientation of policy provided it is, at EMVO’s own absolute discretion, sufficiently proven. Which Company WON'T BE the EMVO On-Boarding Partner? CMO’s (Contract Manufacturing Organisations) and 3PL’s (Third Party Logistics providers) are employed by OBP’s (On-boarding Partners) to provide services on their behalf and will generate data that has to be provided to the EMVS by some means. CMO’s and 3PL’s do not hold any rights, and therefore no responsibility concerning the product. Before an OBP can connect to the EU Hub, it needs to sign the OBP Participation Agreement (PA). This document is provided in the OBP Portal. The following four steps are summarised as Contractual On-boarding to the EMVO. As part of this process, and to ensure that only legitimate companies can access the EU Hub, a legitimation process will be executed. This step also contains the payment. When the contractual On-boarding is done, the Technical On-boarding Process starts. 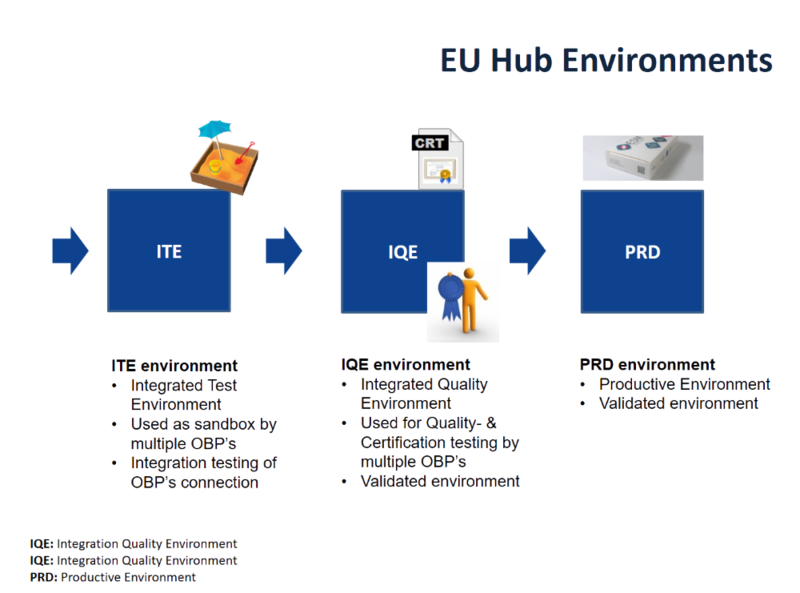 During the Technical On-boarding, the OBP will connect to the three EU Hub environments. In the picture below, the high-level actions of each environment are described.